Last Sunday William VE4VR, Colin VE4CST, Les VA4LES and myself headed up to the location of our VA4WAN high-speed networking site. Had to re-establish some good weighting on a unit outside and ensure it was strong enough to withstand the high winds like we had a week prior. Good thing it was built like a tank – no damage! The rats nest of PoE injectors was just that — a mess, so we had to do something .. re-org a bit better. I think we need to invest in a good multi-port PoE injector unit for this site — sure would help keep things neat. A new router-board unit with a metal box to help keep unwanted stray RF out of it was also installed – will help no doubt. 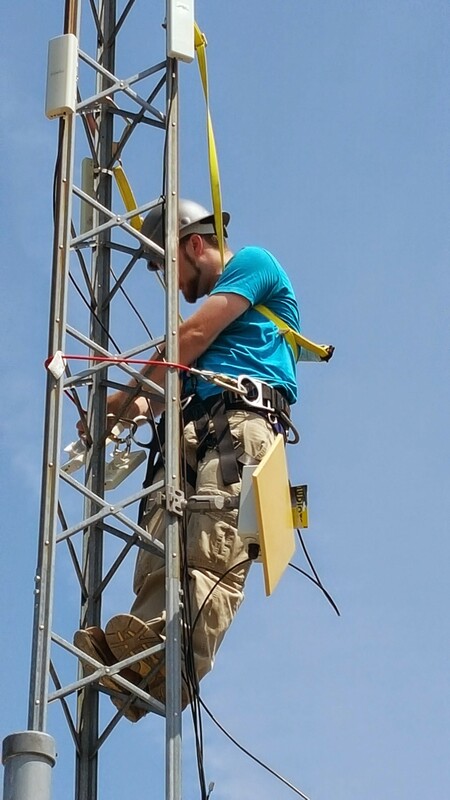 Our new 5GHz link radio and antenna was installed to point to our soon-to-be-new multi-connection point. That will offer us dual BGP routing to our network from two major net connections .. wowser! fun times. Took a lot longer than expected – over 6 hrs 🙁 but we’re in a better position now than before. A wee bit more work on things and it will be even better. Today, I spent a hour or two working on a local ham’s nano station to ensure it is connecting properly to our network – so it’s line of sight and works like a charm 🙂 Happy days.